Construct High Occupancy Vehicle (HOV, or carpool) lanes in each direction of I-5 between Magnolia Boulevard and Buena Vista Street. Construct a new interchange at I-5 and Empire Avenue. Elevate the railroad at Buena Vista St and San Fernando Boulevard to eliminate the street-level crossing. Realign and elevate the railroad adjacent to Empire Avenue. Reconstruct (remove and replace) the Burbank Boulevard overcrossing with a wider structure and realign the on- and off-ramps. Improve the intersection of San Fernando Boulevard/Victory Place at Lincoln St.
Elevated railroad tracks over Buena Vista Street. Empire Avenue undercrossing, looking eastbound. Future southbound I-5 Empire Avenue off-ramp. New pump house in progress. Empire Avenue undercrossing retaining wall. Rebar will support concrete panels. Support structures for railroad tracks over Buena Vista Street. Buena Vista Street bridge deck widening, looking south. Concrete panel design for Empire Avenue undercrossing retaining wall. The increasing use of Burbank’s Bob Hope Airport and construction of the Empire Center at the former Lockheed site impacts both regional and local transportation networks, requiring measures to improve freeway access, efficiency and integration of a multimodal transportation system. Currently, I-5 traffic is forced to use circuitous routes through residential and local city streets to get to the airport and other destinations, increasing traffic congestion. This project will enhance I-5 in Burbank and improve traffic circulation by adding carpool lanes in each direction between Magnolia Boulevard and Buena Vista Street, constructing a new interchange at I-5 and Empire Avenue, reconstructing the Burbank Boulevard overcrossing and realigning ramps, elevating the railroad at Buena Vista Street and San Fernando Boulevard and adjacent to Empire Avenue, and improving the intersection at San Fernando Boulevard/Victory Place and Lincoln Street. The project will relieve congestion, improve traffic flow and provide easy access to Bob Hope Airport and shopping centers. Construction is expected to be completed in late 2020. The project cost is $355 million. 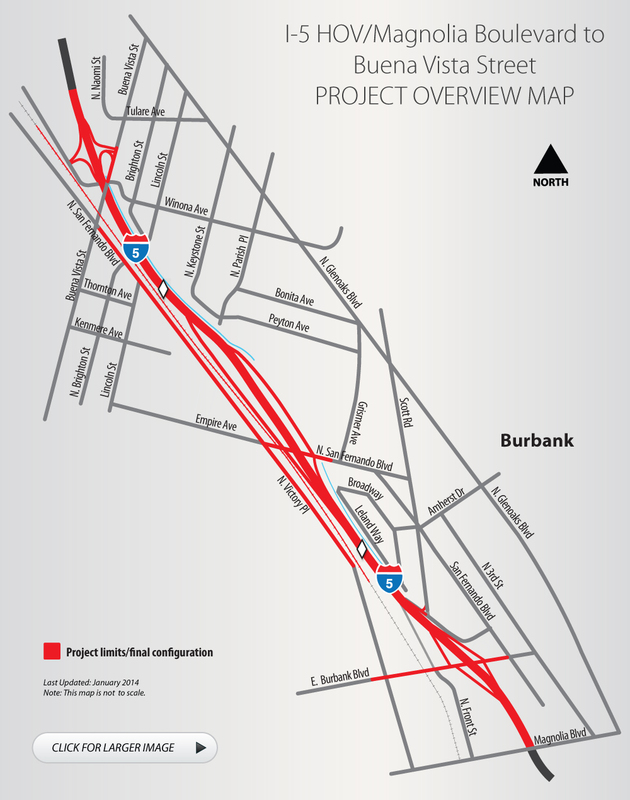 What improvements are planned for the Burbank Boulevard overcrossing? The Burbank Boulevard overcrossing will be widened to accommodate the new carpool lanes, and the on- and off-ramps will be reconfigured. Also, the overcrossing will have a wider sidewalk and bike lanes. How long will the Burbank Boulevard construction take? About 14 months to 16 months, weather permitting. Will the Burbank Boulevard overcrossing and Empire Avenue interchange be under construction at the same time? No. The Burbank Boulevard overcrossing will not close until the new Empire Avenue interchange and undercrossing are fully operational. What will happen to the on- and off-ramps when Caltrans is reconstructing the Burbank Boulevard overcrossing? The off-ramps will remain open. The on-ramps will be closed. Will motorists still be able to access the commercial district? Yes. Caltrans worked closely with the City of Burbank to develop effective detours for each project phase. Traffic will be monitored and adjustments will be made as necessary.